As an independent payroll provider, securing and keeping your clients is your biggest challenge when your competition is the likes of Paychex and ADP. "Why would small business owners work with an independent payroll provider or accountant like me?" Those were the exact thoughts running through my mind when I started my payroll practice nearly six years ago. Today, my small team and I service nearly 200 clients, and Cirrus Payroll is growing faster than ever. ● Operate as an online company, where employees can work remote, rather than congregating every day at an office. ● Our software needs to be cloud-based, and allow both us and our clients, as well as our accountant referral partners, to access the system 24/7. ● Be completely paperless. That means clients need to be able to print checks in-house. I read the book The E-Myth right around the time my business started. It drilled into my head the importance of creating the right processes, and writing them down. This means that onboarding, payroll processing, quarterly filing, year-end tasks, and even client terminations are documented step-by-step, so there’s never a question of how to get the job done. Your employees will clearly understand their job responsibilities and be able to work efficiency and effectively. There’s nothing quite like a company where employees are passionate about what they do, and everyone knows their role and exactly how to get it done. One of our keys to payroll success has been clear definition of our processes. With Payroll Relief's Snapshot, my staff can log in every day, see exactly the payrolls that need to be processed and any other upcoming tasks. So in one screen, I can get peace of mind that we’re on top of everything. The level of automation your payroll solution provides greatly impacts your bottom line. Payroll Relief has taken care of almost all compliance work, including direct deposit, payment of garnishments and child support, tax payments, and e-filing of tax forms. Knowing that my business is running as intended day-to-day, based on structured processes, gives me peace of mind to focus on my business every day: strategy, sales, marketing, and supporting my team. Payroll service bureaus boost their efficiency through batch processing. Payroll Relief delivers the same batch processing capabilities for printing of paychecks, and printing and e-filing of W-2’s, W-3’s, 1099’s and more. That saves a tremendous amount of time. With the pricing structure of Payroll Relief, I could see that I could scale up and become more profitable over time. There was really no end to the number of clients that I could profitably bring on to the system. some of the other work I was doing." That’s why choosing the right software is so crucial. There are payroll platforms that have two competing sides – a solution for accountants, and a version they sell directly to my small business clients. But there is no way those companies would sell me a solution that gives me a competitive advantage over them. Payroll Relief is different – it’s only sold to accountants. I know this solution isn’t going to compete with me, and that’s a huge difference. I’ve been using Payroll Relief for about 5 years and I can tell you AccountantsWorld has lived up to its promise. Once you have clear processes in place, it’s important that you don’t let clients dictate your workflow. Of course, every client is different so slight variations are acceptable. But if you stray too far from your standard procedures, you will only create chaos and confusion for everyone involved. It’s better to grow healthy, with the right clients, and not give in to every client whim. I have turned down good-paying clients, because I knew they weren’t the right fit for us. Stop trying to be all things to all people. The market for payroll services is huge. If a client doesn’t work out, move on to the next prospect! 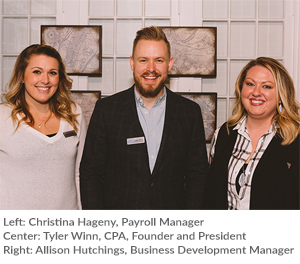 As an independent payroll provider, attracting and keeping clients is your biggest challenge when your competition is the likes of Paychex and ADP, and you need an answer for the question: Why would small business owners work with you instead of those large bureaus? For my firm, part of the answer is highly personalized service. But there’s a lot more, and it starts before a client joins us. ● Fix your website. If it looks like every other website in your industry, something is wrong. You need to showcase how you are different, and how you come alongside your clients and help them succeed. No one is reading that long company history page, your resume or list of qualifications, or the paragraphs detailing every service you provide. Narrow down your website, and keep it relevant to what a prospective client should know. ● Get good reviews. Start by asking your best clients to write a review for you on Google and Facebook. Once you get some good reviews, request reviews as part of your new client onboarding process. And don’t be afraid to ask repeatedly for reviews. People are busy and need friendly nudges. ● Stop being boring. Stop sending mundane newsletters and posting technical updates on your social media. Let me be very clear: No one is reading it. Instead, post content that is engaging and adds value to the reader.